Michael Newdow, the atheist who fought all the way to the Supreme Court to remove “Under God” from the Pledge of Allegiance, has just filed another lawsuit to remove “In God We Trust” from U.S. currency. The federal lawsuit, which was filed in Akron, Ohio, may be unique for relying not on the First Amendment’s Establishment Clause, but on the Religious Freedom Restoration Act (RFRA). In essence, Newdow takes the same argument used by Hobby Lobby to get out of covering contraception for its employees and says that the U.S. Treasury can’t push God onto atheists without a “compelling governmental interest,” which he believes they don’t have. 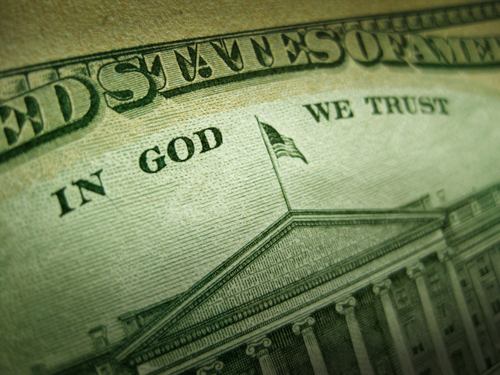 There is obviously no compelling government interest in having “In God We Trust” on our money. We did fine for the 75 years before the phrase was ever used at all, and continued to do fine for the subsequent 102 years before such inscriptions were made mandatory on every coin and currency bill. Similarly, the vast majority of nations manage to function without religious verbiage on their money. Accordingly, for those who feel that being forced by the government to carry a message that violates their religious ideals is substantially burdensome, lawsuits are now being prepared in the seven (of twelve) federal circuits that have not yet heard challenges to this governmental practice. Although the arguments demonstrating that the godly inscriptions violate the Establishment Clause will again be raised, the RFRA claim will (for the first time) be the lead argument in each case. Hopefully, in at least one of those circuits, two appellate judges will be willing to acknowledge the statutory violation. He actually put a call out for plaintiffs in that post, and many readers responded from across the country. This particular lawsuit has 41 plaintiffs. They include many unnamed parents and their kids, several named individuals, the Michigan Atheists and Northern Ohio Freethought Society groups, and one believer (Adam Clayman). The defendants include Congress, the government, the Secretary of the Treasury, and others. By placing “In G-d We Trust” on the nation’s coins and currency bills, Defendants have substantially burdened Plaintiffs in the exercise of their Atheistic (and similar) beliefs by requiring them — as the price to pay for using the nation’s coins and currency bills — to personally bear a religious message that is the antithesis of what they consider to be religious truth. Similar, for Plaintiff Clayman, Defendants have required him to sin. Again, you can laugh at all this, but remember that there’s a case that’ll go in front of the Supreme Court very soon that revolves around Catholic nuns who say filling out a short form to get out of paying for contraception for their employees is a violation of their faith. If you have a firmly held religious conviction, the courts don’t get to judge how silly it is. Newdow is using that logic to make a very different kind of argument on behalf of atheists. Will this be successful? I think he has a better shot of winning Powerball. You could think of it another way, though: The question isn’t whether Newdow will win, but why shouldn’t he win? What makes his case frivolous — as I’m sure some critics will claim — but not all those other RFRA ones brought up by religious groups? Remember Newdow’s ultimate strategy: He wants to fight these cases in every Appeals Court in the country. All he needs is one to agree with him — that’s what happened with his Pledge of Allegiance case — and there are half a dozen left that have never ruled on the “In God We Trust” issue. That includes the Sixth Circuit (which covers Ohio). Even if he loses in one Circuit, he’s going to keep trying in the others until he’s exhausted all options.